This is a fantastic little story, told by none other than the Premier League’s best left-back Andy Robertson! 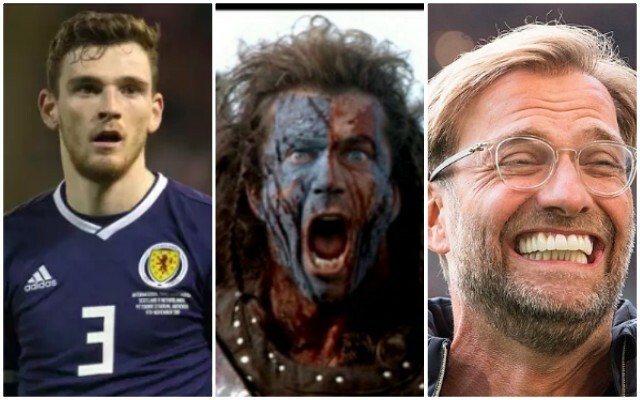 Our 24-year-old was recently made Scotland captain; a reward for his exceptional form at Liverpool since winning a spot in the side last Christmas. Since then, Robertson has made the position his own, played in a Champions League Final and garnered the respect of fans, coaches and players around Europe. He now wears the armband for his country and explained how he alerted Jurgen Klopp of the news. “It was just out of respect because I didn’t want him finding out off of someone else. “I said ‘thanks very much for all you’ve done, I’m going to be Scotland captain, I hope it can be a success’ all that sort of stuff. “And then he just text back in big capital letters ‘You are the real Scottish Braveheart now’! How can you not love both of them! Klopp initially used Robertson very sparingly, with Alberto Moreno in fairly decent form, but once the Scot got into the side, he hasn’t looked back. We’d suggest the only left-back close to him in the top flight is Benjamin Mendy, but the Frenchman is perpetually injured, while Robbo plays every week. So far this term, he has six assists in all competitions – the highest of any Liverpool player. And he’s only going to get better.